When last we heard from our friends at Conneaut Lake Park in Pennsylvania, they had just won a Pepsi “Refresh” $50,000 grant to go toward the restoration of their classic Blue Steak roller coaster. This grant plus the continuing support of park fans and coaster enthusiasts have made it possible for the Blue Streak to remain open for the whole 2011 season, the first time in a long time, and hopefully for seasons to come. 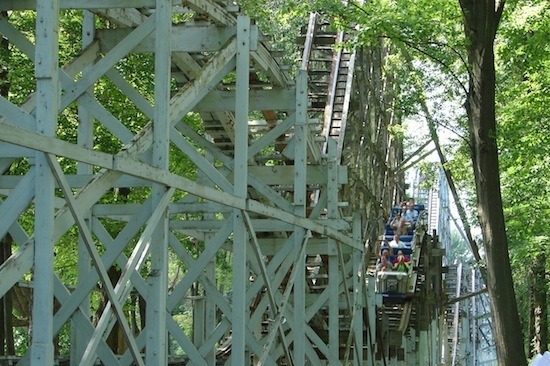 Click Here to learn more about the Blue Streak and the park’s history in my original article. So, why does “this place matter”? Well, chances are, if you are reading this blog, you are a theme park/amusement park fan. To me, these parks are a place of great joy. In particular, older parks are a slice of Americana that connects us to a collective past. People like Walt Disney surely visited places like Conneaut Lake Park on the road to building their own parks. As amusement park fans, we should want to preserve this part of American history. Whether or not you have ever been to Conneaut Lake Park, the preservation of such places for the next generation should be the ultimate goal. Voting for the 2011 This Place Matter Community Challenge ends today, June 30, 2011 at 5 p.m. EST and can be accessed here: PreservationNation.org/communitychallenge. You’ll need to click on the List of Sites link, and then click the link for the project page listed as Conneaut Lake Institute. An e-mail address gets you one vote. If you are interested in the Blue Streak Roller Coaster or wish to donate to the restoration fund you can still do so by going Clicking Here.